The edges of my jean pants have been worn out. The white lines are occasionally bared to the outside, although I keep cutting them off. The white lines some times run under my heels and hinder my walking. I wonder if there are some ways to save my pants? Thanks! They are too long for you. (Or for the shoes you choose to wear). You need to get them hemmed to your show height. In fact you should have one pair for flats and one pair for heels. There isn't much you can do here, but you should just get these hemmed to be your flat jeans, and get a new pair to wear for heels. A proper length of jeans for heels is about 1 inch from the ground/bottom of your heel. Thanks! How do people usually hem their pants? If by themselves, what steps can I follow? Personally, I take them over to my tailor, or the dry cleaner that does tailoring. It is usually about $5-10. And they will match the threads and stuff do it looks original. I'll let someone else chime in on how to do it yourself. I imagine it is easy, once you get the measurements right. Sewing 101 if you will, but I can't hang a picture straight, so I like my items pre-creased if I am going to fix up a hem. I can't sew very straight by hand, so my at home stuff is limited to buttons and simple repairs. From the picture, the rest of the fabric looks like it's wearing out also. You should probably weigh the cost of repair vs replacement and see if it would be better to get a new pair of pants or try to save those. It will probably cost $10 to have them hemmed up, assuming that there's enough fabric to turn them up past the split edge without making them too short. If you don't have a sewing machine, it's difficult to hem jeans and have them come out looking right. 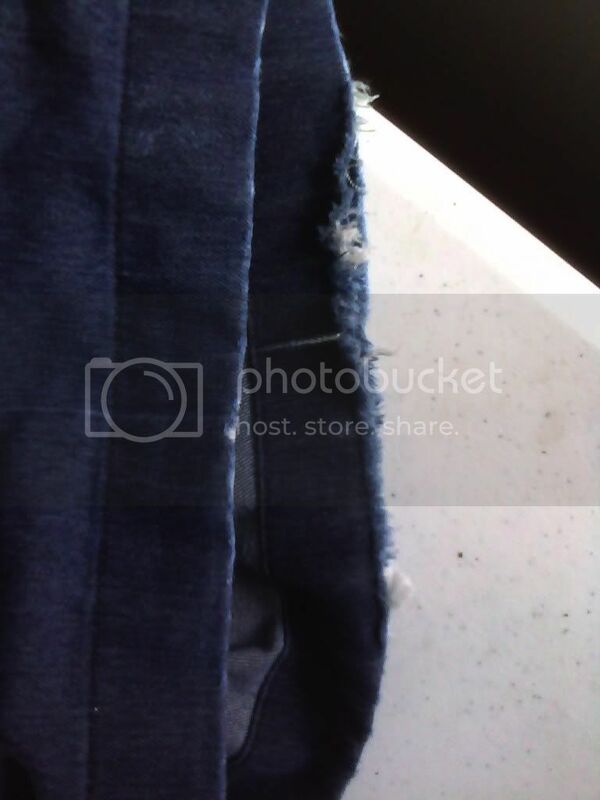 This is how I hem jeans with the sewing machine: Turn the jeans inside out. Put them on. Put on the shoes you will wear with them. Turn the ends up to the right height, and pin in place. Stand up straight again and check the length in the mirror. Sit down in a chair to make sure they don't look weird when you sit. If the length is good, take the pants off. Iron the ends of the pants where you've folded them, until the crease will stay when you take the pins out. 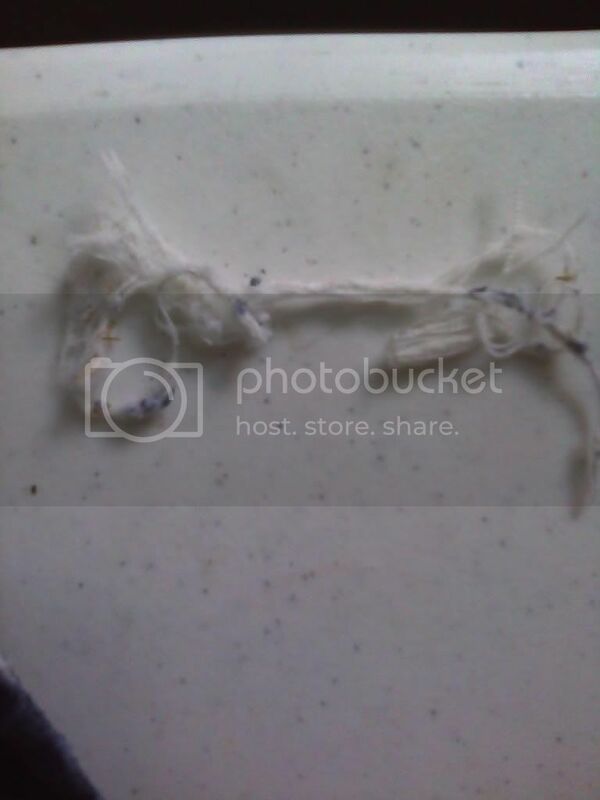 Remove the pins, trim the fabric to about 1". (If you are shortening them less than one inch, you would probably just sew it in place without trimming it, in which case, leave the pins in until you sew it.) Fold the raw edge of the fabric (the edge where you just cut) under and pin it in place, so that the raw edge isn't visible. Iron it again so that it's nice and smooth. Then using your sewing machine and a jeans needle, do a straight stitch all the way around the pants leg, overlapping a little bit, removing the pins as you go. Repeat for the other leg. Turn the jeans right side out. It sounds complicated but I do this for at least 12 pairs of jeans every year, 5 for each of my kids and 2 for myself gets easier with practice. Cut you some daisy dukes! How about you go to a store (even a Thrift Shop if $$ is tight), and you select clothing that you like and that fits properly? I like to imagine that the OP has been cryogenically frozen for many years and has to acquaint himself with our modern ways. His threads are more amusing that way. Get shorter jeans, longer legs, or taller shoes.